I know it’s nature but…. ….I don’t have to like it. As the day broke on this chilly morning, I sat at the kitchen table and observed at least two dozen bluebirds descending upon the rooftops and chimneys of neighboring homes. Eureka! This called for another cup of coffee and a camera to try and capture the migration moment. I love it when a day starts like this one! I watched wave after wave of bluebirds arrive to dine on mealworms, sunflower seeds, and to take a sip from the still icy birdbath. And I smiled as I drank my coffee and clicked away with my camera through the window. The bluebirds’ arrival encouraged the arrival of a large number of goldfinches that swarmed and drank and ate. Oh, such fun avian activity adding to our ever present juncos, cardinals, blue jays, nuthatches, titmouse and chickadees. It was a bird party. But the party ended suddenly. I glanced up and not a bird to be seen. That is except one. And that one was definitely NOT invited to the party. That party crasher was sitting on the bluebird house. I had to admire its beauty but hoped it wouldn’t stay. Seconds later, I saw my blue jay dart out of a nearby shrub screaming and the cooper’s hawk was just feet behind. I hope the jay made it to safety. I know it’s nature but I don’t have to like it. What fun it is for us to enjoy morning coffee while being entertained by this communal bathing scene. It’s a great time of year for birding! Breeding season is over and the once territorial birds call a truce as they drink and bathe together. Bluebirds, sparrows, warblers, finches, chickadees, cardinals, and more… all are splashing together in the bird bath this fall. Birds like clean water and they find our birdbath to their liking. Each morning the water is emptied and the birdbath refilled for our feathered friends. Why do birds bathe? No one knows the exact answer. I was taught it helped to rid themselves of parasites, but experts say it could be that AND it could be that clean feathers help them fly better. Following the bath, birds will land nearby to perform a ritualistic preen spreading protective oils over the feathers. Many of the birds we see will soon be joining others for the trip to warmer climes. We’re happy to send them off with full stomachs and clean feathers! October can be an exciting month for birdwatching. We’ve watched wave after wave of migrating songbirds and shore/water birds pass through this area of southern New Hampshire. Many birdwatchers travel to migratory hot spots to watch the action but we believe we have a good seat right here on the 50-yard line to watch all the birding action we desire. We’ve followed ducks, geese, vireos, sparrows, warblers, bluebirds, cedar waxwings, hawks and more, stop to rest and dine for a few days before taking off again. 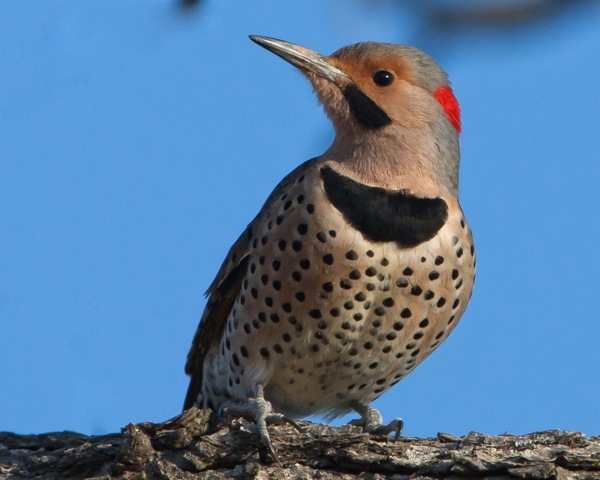 One new visitor I’ve especially enjoyed watching this week is the Northern Flicker, the Yellow-shafted Flicker (Colaptes auratus), a larger bird related to the woodpeckers and sapsuckers. Not an uncommon bird, but it’s fun to watch. It stands out on the horizon as it swoops and dips in flight, its large white rump visible only in the air. I admired his distinctive spotted plumage as it fed on ants and other insects on the ground beneath the white pines . October is also great time to observe migrating hawks that land in the pines, perch on tree limbs, or circle the salt marsh looking for food. As in Virginia, a hawk we often see is the the Cooper’s Hawk (Accipiter cooperii.) that scans the horizon from its favorite perch in nearby trees. What is the Cooper’s Hawk looking for? Birds. And what did the last Cooper’s Hawk find? Yep, that’s right. 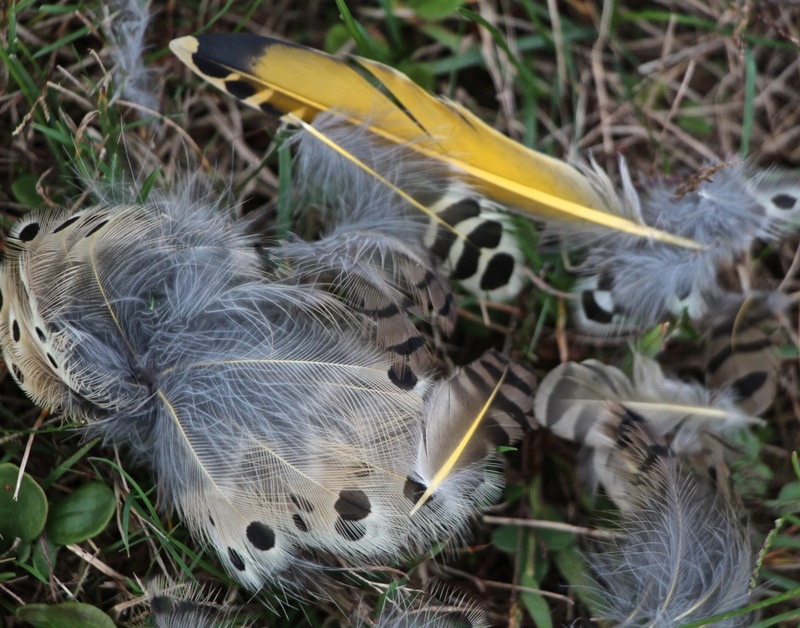 Our Northern Flicker nourished the hunter so it could continue its journey south. It’s always a bit unsettling for me when I discover a fluff of a bird that was. But understanding nature in its fullest is understanding the delicate cycle and balance of the natural world. Windy weather in New Hampshire yesterday ushers in a cold front today, perfect weather for spurring on bird migration. We’ll have our binoculars (and warm coats) ready.